In order to put out Christmas decorations, we have to clean. The girl wants to be in charge of the Christmas village, which consists of two newspaper offices and a spooky castle. 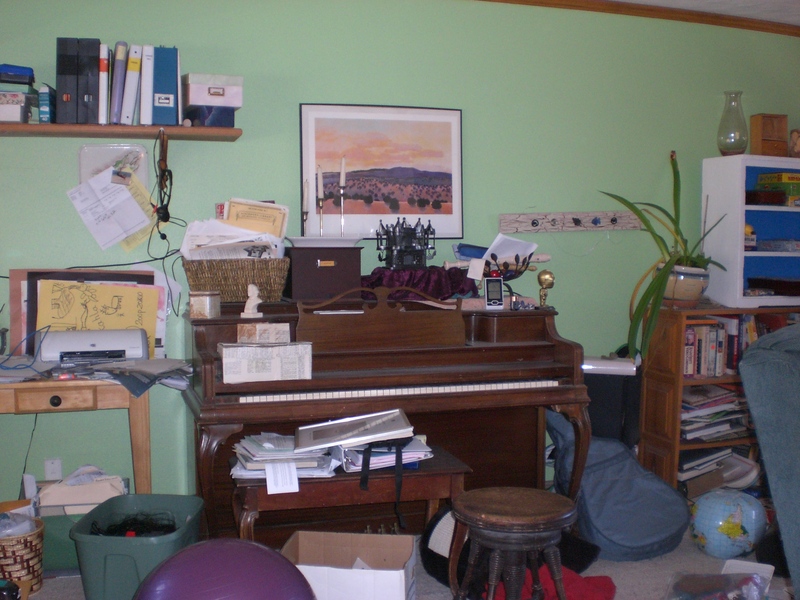 As we start clearing off the piano, I am realizing that one of the reasons it hasn’t been cleaned before is because of some unfinished business. There is a big basket of sheet music that dates back to when the girl took piano lessons. I mean, it dates back to when the girl quit piano lessons. I am tempted to put the whole pile in a box to be dealt with at some later date. No. Must deal with now. Wish me luck. OK. It is later, and it wasn’t as bad as I thought. I went through the basket while the girl dusted the piano. I got rid of some bad memories, and was able to pull some Christmas music to the front of the basket. We pulled out a vintage linen tablecloth to represent snow, and she set up the buildings, plus the spooky castle on the hill. Then she actually added to it, making some houses, and an ice skating pond. In a perfect world, she would then sit down, pull out some Christmas music, and start playing piano. Needless to say, that didn’t happen. I guess I can dream. EVER so glad my house is not the only one that looks like a tornado hit right before I get the tree up and all…my 4 year old even said, “Mommy this looks like a BIG MESS!” Well…when you own 47 boxes full of 3687 Christmas decorations, it gets messy before it gets better. I should purge the Christmas decor…but lets be honest…as soon as I have what I want out of the boxes (this year) I just pack them all back under the stairs…if the stairs ever collapse, we won’t be injured. The Christmas decorations under there will help maintain architectural integrity. Holy Moly! 47 boxes!!!! I was feeling bad that I had four. Now I see that I need to go shopping!!! !